My youngest brother Adam’s birthday just happens to coincide with crawfish season in Texas. For the past several years, he has celebrated his special day by hosting a crawfish boil with lots of friends and family. And mudbugs. It’s always a great party that we look forward to attending, and this year was no exception. Adam’s girlfriend has a lovely house on a nice piece of land large enough to accommodate her two horses. Her place is just far enough out to make you feel like you’re in the country, without being in the middle of nowhere. My mom enjoyed meeting the horses. He may be cute, but apparently he’s not a very nice mini horse. The crawfish boil equipment includes propane and a very large metal container full of boiling water. Adam’s friend Phil is usually in charge of boiling each batch of crawfish. He adds just the right amount of spice. To the boil AND the party. The kids at the party were surprisingly fascinated with the crawfish and spent a lot of time playing with them, in between helping to load them up for the boil. A little more spice, with a side of Guy Who Is Pretty Excited For His First Batch of Crawfish of The Day. In addition to the mudbugs, corn cobs and small red potatoes go into the boiling water. Boiled and ready to eat. The corn and potatoes take on some of the spices from the crawfish seasoning and are really good. These ingredients also allow you to feel like you’re actually getting some sustenance, since the only part of the crawfish you eat is the meat from the tail, and the tails are pretty tiny. Dan is ready for his first crawfish of the day. Heads up (or off, if you’re a crawfish) — eating mudbugs is not pretty. You have been warned. Next, peel the shell and legs off the tail portion. Bonus points if you can de-vein the crawfish as you peel off the shell. (Seriously, I warned you.) The tiny morsel above is the part that you eat. See why it’s also good to have potatoes and corn? 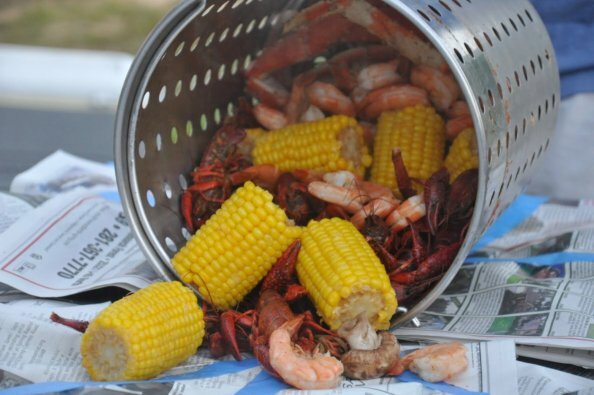 A crawfish boil is a social event, if for perhaps no other reason than everyone tends to crowd around the trash barrel to discard the heads. As with any good crawfish boil, we enjoyed some great Texas music in between batches of crawfish. What party out in the country would be complete without a game of washers? For those who’ve never played, the object is to toss the washer into the inner white circle for the most points, the surrounding box for less points, or the dirt for zero points. This was a rare point-getting shot. Some people are better at washers than other people (DAN). The little girls at the party spent quite a bit of time separating the live crawfish from the dead ones (can’t boil the ones that are already dead.) Seriously, these girls had no fear and were not the least bit grossed out by those things. But there is something so wrong about cute little girl feet in a darling little dress, standing among discarded dead crawfish bodies. In addition to the crawfish, one of our great family friends brought pickled shrimp that was delicious. She also brought two types of sausages that were amazing. Thanks Sandi! Adam’s friend Ben created a triple-decker-toothpick of pickled shrimp, sausage and more shrimp. And of course, there was birthday cake for the birthday boy. The final — and best — batch of crawfish included shrimp and crab legs. There was melted butter for the crab, but it was completely unnecessary. The crab was delicious on its own, perfectly flavored with the spicy crawfish seasoning. Also, on the advice of a friend, we added mushrooms to the crawfish boil. Best. Mushrooms. Ever. We had a great time celebrating Adam’s birthday, at what has become one of our all-time favorite rituals of Spring! Thank you so much for being there……Here is to next year!!!! Yall are the best! Cute pics. Love them all. It was good to see you guys again.